A Morristown banner hangs outside the Morrisville Food Co-Op; the banner bears the town's name, the co-op the name of the village. On Town Meeting Day, voters will be asked if they want to change the town's name to the better-known Morrisville. If you’re asking yourself "Where's Morristown?" then you already know the problem. The town of Morristown is almost always called Morrisville — but technically, Morrisville is just the name of a village in the town. The name confusion has long been a minor annoyance in the town of 5,500 people. As local Tom Garvey pointed out, the mailing address only further complicates things. "The 05661 zip code is Morrisville, not Morristown," he said. 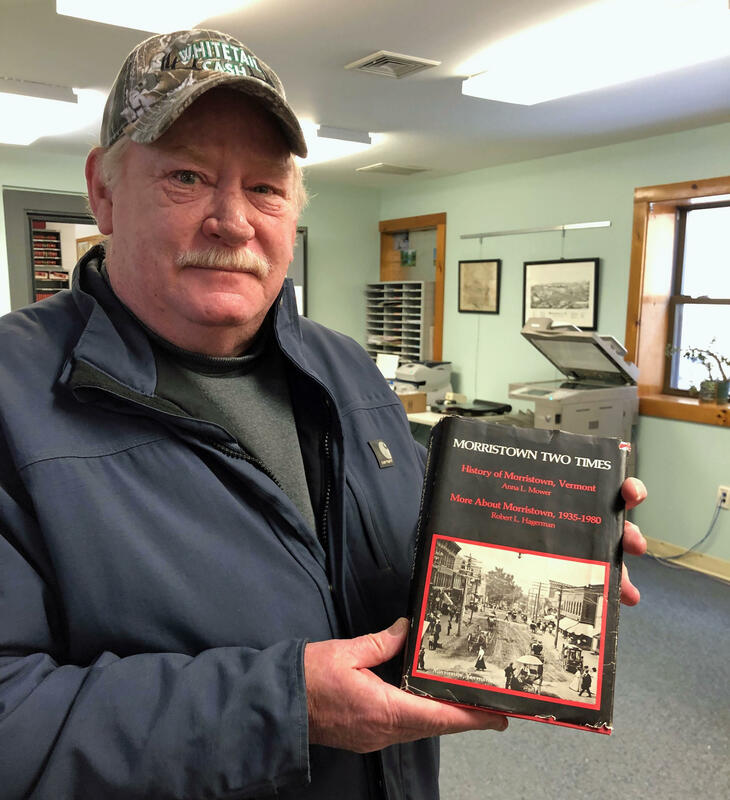 Tom Garvey holds up a copy of the town history book "Morristown Two Times" at the Town Clerk's Office. Garvey pointed out that the old photo on the cover is marked "Morrisville." Garvey thinks the town should go along with the post office, as well as common use, and officially change its name to Morrisville. But that idea generates some strong reactions. Former Morristown Rep. Gary Nolan opposes giving in to the name Morrisville. "I don’t see any reason to change it," Nolan said. "It's worked pretty well all these years." Local business owner Caleb Magoon thinks everyone should be able to come to an agreement. "It wouldn't be the worst thing if we all got on the same page and just called it the same thing – which is Morrisville," Magoon said, with a laugh. Morristown Town Clerk Sara Haskins isn’t taking sides in the debate, but she said the two names can make for some pretty sloppy official paperwork. She said she's seen deeds and mortgage paperwork with Morristown crossed out and Morrisville written in, then that's crossed out and Morristown is penned back. But, unlike Haskins, some people who work for the town are voicing an opinion. In fact, it was town employees who first raised the question with the selectboard. "I think it would be fabulous to change it to Morrisville," said Community Development Coordinator Tricia Follert. "I work for the town of Morristown. My office is in Morrisville. People all the time are like, ‘Who do you work for?’ and ‘What town are you working in?’ Most people know Morrisville." Town Administrator Dan Lindley said he sometimes gets calls meant for Morristown, New Jersey — or he'll get a call for another Vermont town, about 30 miles down Route 100. "People call me and they think they’re calling Moretown, and they get Morristown," Lindley explained. "So, yeah, I’ve had that too." A name change in Vermont wouldn't be without precedent. The current town of Killington used to be called Sherburne — but before that, it had actually been called Killington. It was in 1999 that voters decided to change it back. As shown on the post office window, the local postal address for the entire town is Morrisville, Vt.
Todd Thomas is the planning director, zoning administrator and health officer for both Morristown and Morrisville. He said, as far as the name confusion, "I deal with it every day." Thomas said this vote, which is just to gauge public opinion, could lead to something bigger. The village of Morrisville is governed by a board of trustees, independent of the Morristown selectboard. Perhaps, Thomas said, they too could merge. "One of the impetuses for the name change in the first place is about further merger of our town government," Thomas said. "If we can't call ourselves the same thing, we’re never gonna merge our town governments." And in the long run, he said, merging the municipalities of the village and town could save a lot of duplicate work as well as confusion. Vermont consistently ranks among the least religious states in the country. In Lamoille County, churches are consolidating in an effort to stay relevant. As peak foliage colors spread across the Green Mountains, it’s not a bad time to go for a drive or a bike ride. One good route is the newly-expanded Green Mountain Byway. It was a tough winter for Thea Alvin. On Dec. 18, 2017, life changed overnight for her and her partner Michael Clookey.